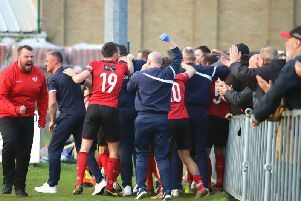 And it proved to be a notable day for Steve Kinniburgh’s team as the home victory guaranteed their place in the Evo-Stik League South Division One Central play-offs. The title looks like the title will be going to either Peterborough Sports or Bromsgrove Sporting but the Steelmen will, at the very least, get their shot at promotion once the regular campaign has ended. This was a most welcome performance and result. March proved to be the month where Corby’s title hopes faded away but they have ended it on an encouraging note and can certainly head into the final five matches of the season and then the play-offs with added confidence. Berkhamsted, who are still chasing a play-off place themselves, started brightly and forced a couple of corners and from the second of those, Martyn Box’s kick smacked off the outside of the near post. But they rarely threatened after that as Corby got into their stride. Berkhamsted goalkeeper Xavi Comas-Leon held on to a Gary Mulligan header after the stopper had only half-cleared a Sam Warburton corner with a punch. However, the Steelmen did take the lead on 17 minutes when Elliot Sandy threaded the ball through and Jordon Crawford ran on before rolling the ball past the advancing Comas-Leon. Clear-cut chances were few and far between after that but it was Corby who remained on the front foot with a couple of driving runs from Northampton Town youngster Camron McWilliams catching the eye. The Steelmen were almost caught cold at the start of the second half as Ben Spaul charged through the home defence but saw his final effort roll agonisingly wide of the post. If that was a wake-up call, it had the desired effect as Corby hit back. Sam Warburton delivered a corner from the right and Joel Carta was there to head home at the far post. But the two-goal advantage was halved just eight minutes later when a long ball forward wasn’t dealt with and it broke kindly for Matt Bateman who got round Dan George before scoring into the empty net. Undeterred, the Steelmen got back on the front foot and Sandy curled an effort just over the bar before Carta saw his free-kick turned round the post by Comas-Leon. But they did get the breathing space they needed with 12 minutes to go. A corner was cleared but Gary Mulligan clipped a ball towards the far post. It looked to be heading out but Crawford refused to give up the ghost and stretched to turn it back into the danger area and Carta was there to slam home a close-range volley. It was far from plain sailing in the latter stages, however. Berkhamsted gave it a real go late on and Jonathan Lacey saw an excellent free-kick cannon off the crossbar before George produced a decent save to beat away a fierce strike from substitute Cameron Brooks. But Corby saw it out to seal the points and their play-off place. Steelmen: George; McWilliams, Mulligan, Anton, Warburton; Newell (sub Francis, 57 mins); Kennedy, Carta, Crawford (sub Ling, 85 mins); Sandy, Diggin (sub Fortnam-Tomlinson, 90 mins). Subs not used: Gordon, Smith. Berkhamsted: Comas-Leon; Towell, Kinnane, Farrelly, Murphy (sub Morrissey, 76 mins); Lacey, Jones (sub Ofuso, 60 mins), Spaul, Box; Collier (sub Brooks, 84 mins), Bateman. Subs not used: Sambu, Weatherill. Goals: Crawford (17 mins, 1-0), Carta (56 mins, 2-0), Bateman (64 mins, 2-1), Carta (78 mins, 3-1). The Raj (www.therajrestaurant.net) man-of-the-match: Joel Carta - There were plenty of a contenders on a good day for the Steelmen with Jordon Crawford and Camron McWilliams catching the eye. But, not for the first time this season, Carta’s goals made the difference. He now has 25 from midfield in all competitions this season, which is an outstanding effort. He showed his ability in the air for the first one and then demonstrated his uncanny nack of being in the right place at the right time to score the third. Without question, he has been the find of the season.